Donna-Norton Vickrey Is Awarded with the Bonnie Drewel Good Neighbor Award! Donna receives the 2013 Bonnie Drewel Good Neighbor Award! It’s always nice to see your hard work and efforts recognized in some way, shape, or form. You strive daily for a smile, a pat on the back, or an encouraging word, which then gives you the motivation and perseverance you need to get the job done. A few weeks ago, our own Donna-Norton Vickrey attended the East Central Board of REALTORS Awards Luncheon on Tuesday, April 2. 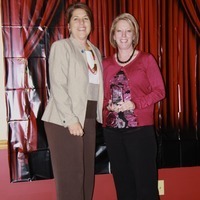 While there, she was recognized for all of her hard work and was awarded the Bonnie Drewel Good Neighbor Award, which is essentially the equivalent of a realtor receiving the REALTOR of the Year Award and is a very big honor for the recipient! 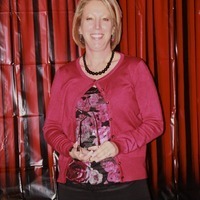 Donna was awarded the Bonnie Drewel Good Neighbor Award for her dedication to excellence, personal leadership, service qualities, and her great involvement in the real estate industry and in the community. If you don’t know who Donna is, she is part of the greatly successful Lisa Coose-Burkemper Team, the #1 residential agency in Lincoln County who, in 2012, averaged a home closed every four days! Donna’s office in Troy, MO is also the #1 real estate office in Lincoln County and closed over 300 transactions for over $37 million in 2012! A resident of Troy, MO, Donna is ecstatic and honored to receive this award from the ECBR, and we are so very proud of her and happy to see her efforts recognized and rewarded! As I drove around the office the past 24 hours I am amazed at how quickly things can change. On the way into work I saw groups of people standing around in their pajamas drinking coffee and looking at the war zone they are faced with. Talking with one another, pointing, telling animated stories of what they have been through. Driving home last night, I see these same people working in each other’s yards, helping each other clean up the trees, the debris. It is about the younger helping the older, about neighbor helping neighbor. While I would never wish these types of disasters on anyone, it always reminds me how much good there is in a community, in an area, among families, among neighbors, among friends. It is not about being rich or poor, it is not about being black or white – it is about being part of a community that cares. 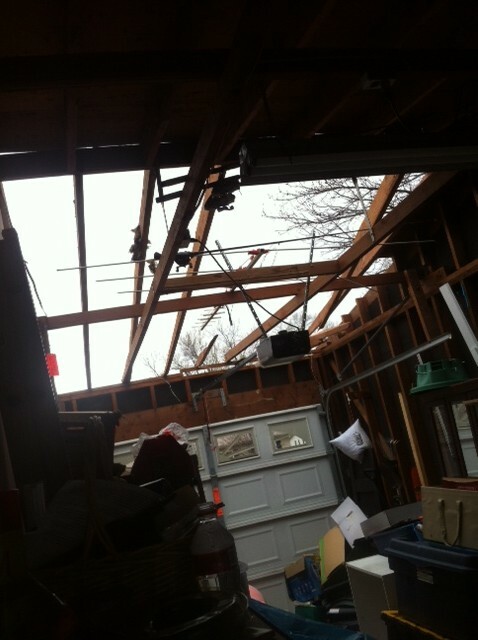 As you may have heard one of our own, Donna Tull, experienced part of this disaster. While in her basement during the heart of the storm she heard what she thought was the door blowing open and rustling up stairs. 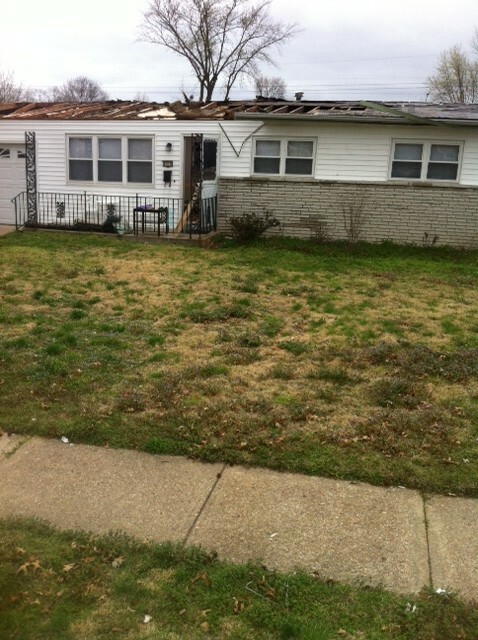 When she went up to see what was going on she noticed that it was raining in her living room; her roof had been blow off her house. When Josh and I got there that night it was just like the pictures you see in the movies, The Wizard of Oz without the cow blowing by. A clean sweep and you have a convertible house. Donna and her family are doing fine; many of you asked if she needs anything now, and we can’t think of anything at the moment. She is staying with us, and we came home to a nice home cooked meal, compliments of family friends who wanted to do something for the Tulls. This led Josh and I to encourage Donna to play this whole thing up when people would offer food. It was the first home cooked meal either of us had in a while so we were happy for the surprise. On the wall, where I went to high school there is a big mural which states the motto of the school – “Men for Others.” If it were an all-girls school it would have said, “Women for Others,” or co-ed “People for Others.” These past few days remind me once again why I got into the real estate business. We are here to serve our community, help people provide shelter for their families, help people create wealth. While the market and sales have picked up tremendously, I think the past 48 hours is once again a reminder to us to stop, look around and show us what is truly important in life, what we are put here for and bring us back to our core values of serving others. As of late last night we still did not have full electric at the office but it is workable. We have Internet and wireless; we can scan and copy in black and white. I will have make-shift lighting today, and the front desk calls are coming to my cell phone. Hopefully when I get there this morning we will be back in service. I will let you know when I get there. If any of you are in need, let me know. We have a whole office and a whole company of people who are willing to serve you. Recently I attended an office event and an agent approached me asking several questions about the upcoming company name and brand change. The agent was running out of her personalized Prudential Select Properties envelopes and was unsure about ordering 2000 more since they will be obsolete in the future. The creative solution she came up with was to make her envelopes in Publisher and print them on her office’s black and white copier. I love Realtors because they are entrepreneurs, and good entrepreneurs always come up with creative solutions. As to the question of the timing of WHEN the big brand switch will be? The answer is 2013 (autumn of 2013 at the earliest). Prudential Select Properties and other Prudential affiliates are all still waiting on the details of the branding, the colors, the look, the logo, etc. But PSP is ready so as soon as this information becomes available we will be able to jump in with both feet to unleash this great new brand on the world and promote our agents with it. Some more details will probably be available at this year’s Prudential Sales Convention called Hit Play in exciting Las Vegas. This convention never fails to motivate and empower agents who attend with new ideas and excitement about the industry. Click here to find out more about the 2013 convention. In the mean time it is business as usual and you can rest assured that PSP has something up our sleeve to promote both the new brand and you when it drops in 2013. If you want to learn more about our future brand, currently you can find information about it at BerkshireHathawayHS.com. And don’t forget to read our previous blog An Exciting New Brand in Real Estate for information about the brand change. Your phone is an extension of your real estate business and Prudential Real Estate recognizes that. To use: from the online supplier catalog click the phone company discount screen to go to the phone company page to sign up for a code to give your carrier to receive the discount. Here is a link to the Prudential Supplier Catalog 2011-2011. It can also be found by logging into prea.prudential.com clicking on Suppliers then Online Supplier Catalog. The least you need to know: We have some new tools premiering in 2012. The first one unveils at Tuesday’s sales meetings. The unabbreviated version: So I’ve decided to move. I own a house in South County and am hoping to find a renter so I can try out city living. I love the idea of stepping out my front door and being able to walk to a coffee shop. Or of having a restaurant a few blocks down. And let’s be honest, of not having a lawn to cut. In an attempt to never get out the lawn mower again I recently began my search. Confession time: I did not use our website system to search. Let’s take just a moment to reflect on this. This is HORRIBLE. I’m the one primarily responsible for guiding decisions about our web presence and I’m not using our system when I need it. During my search I forgot everything I knew about real estate technology and became just another home buyer. I remember standing outside of one particular home in Benton Park, frustrated. There wasn’t a price on the flyer and I wanted to know the information ‘right now.’ (There has be an app for this! was my line of thinking). I typed the address into the search on my mobile phone and pulled up links to Zillow and Trulia. An ad on Trulia reminded me that had a great mobile application that could tell me the homes for sale around me. It simplified my search once I found it. That’s what I want for us. My experience with our online search was worse. 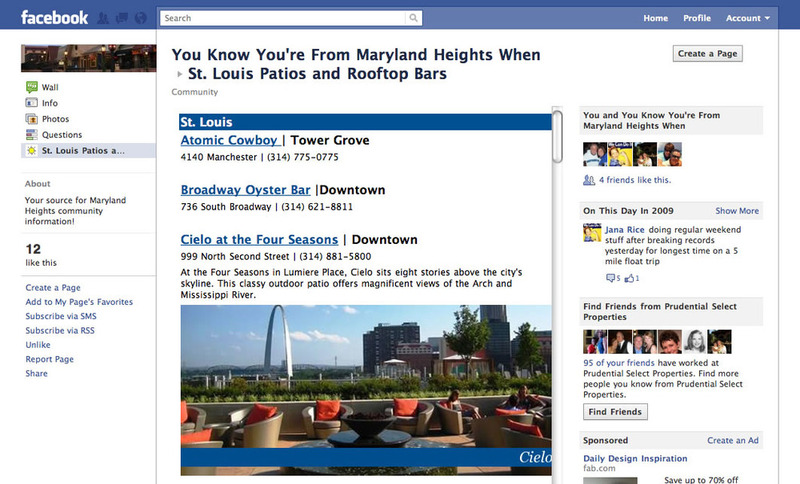 Although I had a plethora of options on DiscoverStL.com it was difficult to navigate through them. And I know our website! What happens to the regular consumer that uses our search? They must be overwhelmed. As we start planning for 2012 we’re going to make some changes that ease your client’s ability to search, save, and share. Since it’s the holiday season we’re feeling in a warm and fuzzy, gift-giving type of mood. The first of these surprises is debuting at your next sales meeting. Tune in. P.S. if anyone knows someone looking to rent in the Lindbergh School District tell them to check out my home here! A friend said to me the other day, “Do you realize the internet is older than incoming freshman.” This started me thinking about technology over the last decade. In 2002, when I was graduating with a masters in Digital Media Communications from Lindenwood, we never once talked about social media. MySpace didn’t exist until 2003 and Facebook until 2004. Last week, Jana and I met with a group of agents from the Des Peres office last week to discuss Facebook, YouTube, LinkedIn and how to use social media for real estate. Social media lets us reach the people we know and remind them about what we do. Currently one of the main players in the action is Facebook. Today there are 750 million Facebook users and 50% of these users log in once a day. This is an evolving media. What was the ‘best practices’ on Facebook ‘ two years ago is not necessarily the case today. And it might not be the same in six months. But I’ll pass along to you a few of my thoughts about Facebook and the way it can currently work with your business. Should you have a Facebook Business Page? I’m sure you all have Facebook personal pages (if not get one! ), but should you have a Facebook Business Page? There’s a great article about Facebook Business pages here called ‘Your Facebook Page is Worthless.’ Done right, a Facebook business page could allow you to reach out to your network. Done wrong, it could be a huge waste of your time. I think the biggest thing to consider before jumping into a business page is: – Who is your audience? Who are you trying to reach? Is it a farming area? i.e., Oakmont Subdivision, Kirkwood, MO. Then maybe you should considering sponsoring a neighborhood page. Give them information on local events, information, services, etc. 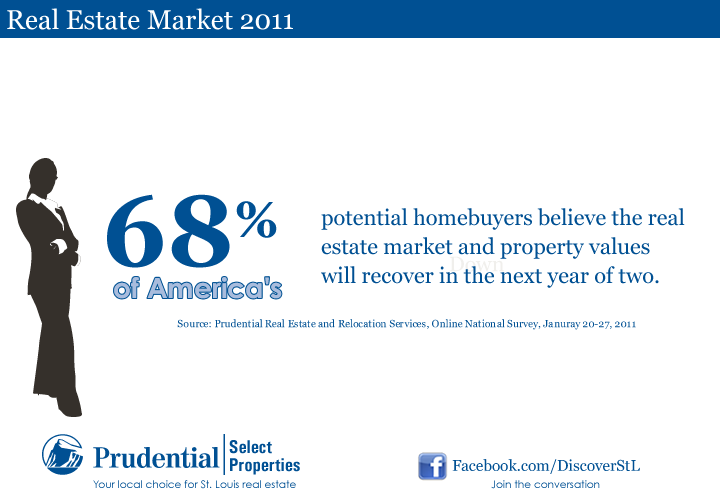 Weave information about neighborhood market trends, recently sold homes, demographics, etc. Is it a group? i.e., your bookclub, your bowling team, etc. Then maybe you should consider organizing a page for this group to connect. Post information about meetings and share articles, links and other things related to that group. Is it your sphere of influence (friends, family, past customers)? If you’re marketing to your SOI, I think that your personal page on Facebook should be your primary focus instead of a Business page. Use the relationships you have already formed there to your advantage; don’t try to re-invent the wheel and start a new page to collect the same group of people! Just remember if you’re combining your business updates with your personal updates, keep it about 80% personal and 20% business. Don’t overwhelm your friends with too much business talk. How do you get ‘fans’? Send out email invitations or postcards invitations to your group (neighborhood, club, etc). to join you on Facebook. Add links to your Facebook page on other profiles you have (Linked In, YouTube, etc). Routinely promote it in your advertising efforts, newsletters, postcards, etc. If you’re targeting a specific group you could consider Facebook Ads to advertise to potential fans. For example if your page discusses Kirkwood real estate you can actually target people that live in Kirkwood using this tool. There’s another great article on Inman I highly suggest you read called Facebook Posting Cheat Sheet. It’s a great read for brainstorming on creative status updates that will engage your fans. You can also check our company Facebook page here and simply share the information on your page by clicking the ‘share’ button. Can you add customization and content? Facebook has recently made a change that allows you to add more customized content to your Facebook pages through application tabs. These tabs could include a custom welcome page, a page of information about you, the community, etc. Here’s an example of tabs on one of my personal Facebook Business Pages. This is the first page the potential fan sees inviting them to ‘like’ the page before they can see the content. Special thanks to Maryann Vitale for hosting last week’s training session and Kathy Schmideskamp, Kristen Turner, Sally Harris, Kim Anderson, Gretchen Adams and Beth Maisak for joining us! Questions? Comments? Post below or email me at Sarah@DiscoverStL.com. I just wanted to touch base with you before tomorrow’s office meeting and catch you up on the results of our new marketing program. We’ve positioned our listings in almost 4.5 million search results on Trulia, Zillow, Yahoo and Realtor.com and driven 168,833 views to our listings. Over 360 buyer email requests were sent out in July and 191 phone calls were placed to our offices. We were only involved half of the month with our new Zillow and Yahoo exposure so I’m anticipating an increase in our August results. This is all great news! I’ve spoken with two managers this morning that both had call-in leads to their offices on property over $900,000 so make sure you’re taking opportunity time! A few updated flyers. . . Lately some of our listings have been used in rental scams and I want to give you a heads up. Scammers copy photos off the internet of a house that is actually for sale. They take the photos and post them on Postlets, Craigslist, Trulia, Zillow, Yahoo, etc., claiming the house is for rent for a low price. Usually the renter is asked to wire a security deposit to rent the home. If you are aware of a scam contact the website where the ad was posted so they can remove the ad. You can file an Internet crime complaint with the Federal Bureau of Investigation at www.ic3.gov. As you all know Zillow gives an automatic value to every home called a Zestimate. I know many of you have expressed that you’re not fans of these! A number of you have asked what about the upgrade on each of these sites so I’ll break down the options for you. If I was an agent in today’s market I would be investing my marketing dollars in one of these online initiatives. Things to keep in mind, if you’re budget conscious you may want to look at Trulia. My experience with them has been they provide the most leads at the lowest cost. However Zillow/Yahoo is the largest real estate portal now so realize that the Zillow/Yahoo relationship may be getting you more traffic. Realtor.com. This upgrade allows you to feature your listings, add more photos and info, and display your direct line. Your cost is determined by your listing inventory. Trulia Pro. This upgrade costs betwen $39 – $149 a month and you essentially are paying for the same options you get with our current plan. My take: we’re already providing the features of this enhancement so I would use your marketing dollars towards Trulia local ads or Zillow Premier. Trulia Local Ads. This upgrade allows you to buy a percentage of advertising space on Trulia by zip code or city. For example you could buy 100% of 63121 and be on every detail page for that zip code, even your competitions. 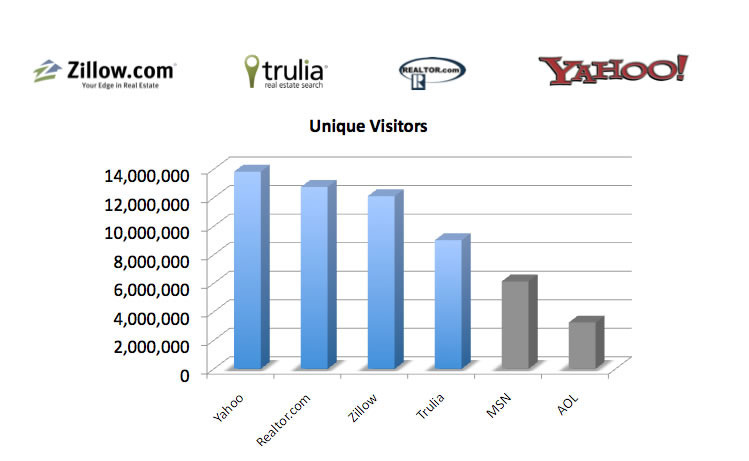 Zillow/Yahoo Premier. This upgrade allows you to display your direct line and capture leads on unclaimed listings on Zillow.com in the zip code of your choice. As with Trulia you can buy a percentage of the share or lock out other agents if you take 100%. For example the zip code 63121 is $56.25 a month for 25%. It would be $225 a month for 100%. As always let me know if you have questions! 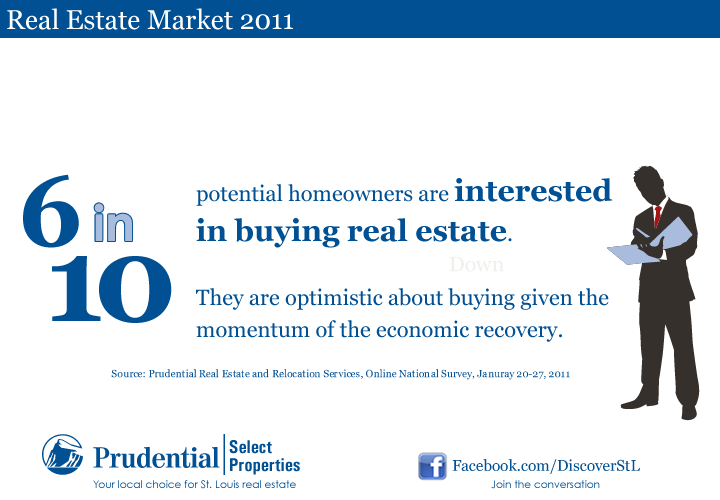 You can reach me at sarah@discoverstl.com. Over the last week I’ve had questions about how to maximize yourself online with our new marketing initiatives. I’ve put together an ‘action list’ for both the buyer and seller realms. Most of you are already set-up to receive leads from the Select Response System. This is where you receive leads directly to your mobile phones. If you’re not set-up this is the first thing you need to do to start receiving leads. If you’ve received a lead from Zillow/Yahoo, Trulia or Realtor.com the client has asked you something and you need to respond to them. This delivers the client every current home on the market that meets their search criteria. This is the #1 way to create return customers to your website! This feature emails the client every new home that meets their search criteria. Optimize your listing descriptions in MARIS for search engines. 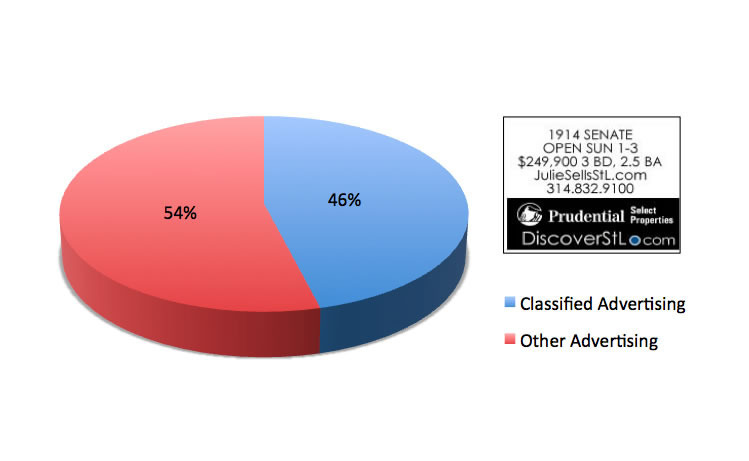 This automated report shows the # of hits the seller’s home is receiving on the DiscoverStL system which includes DiscoverStL.com, your website and the 600+ agent websites at Prudential Select Properties. Also referred to as OSA, these automated reports show the traffic the seller’s home is receiving on Prudential.com. 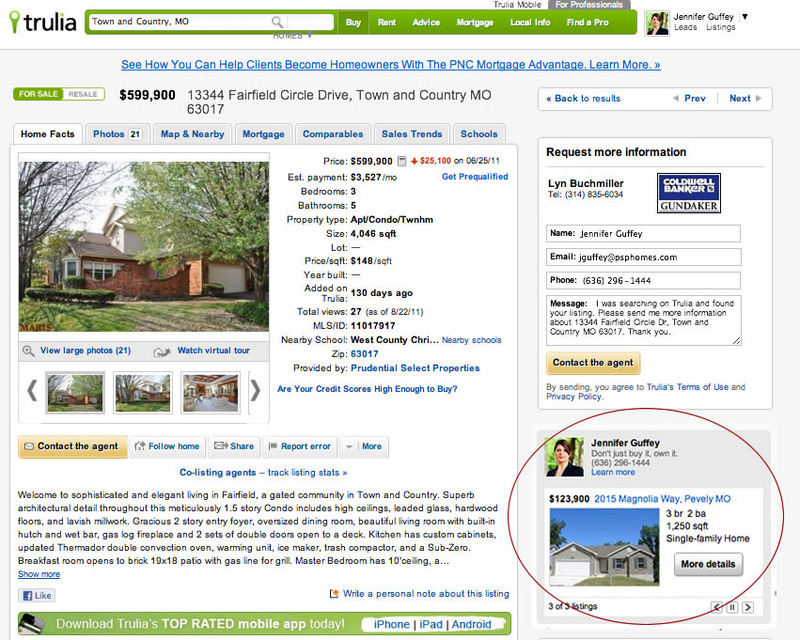 These automated reports show the the traffic the seller’s home is receiving on Trulia. Although most of our website portals display information for open houses automatically, any open houses on Prudential.com need to be entered manually. 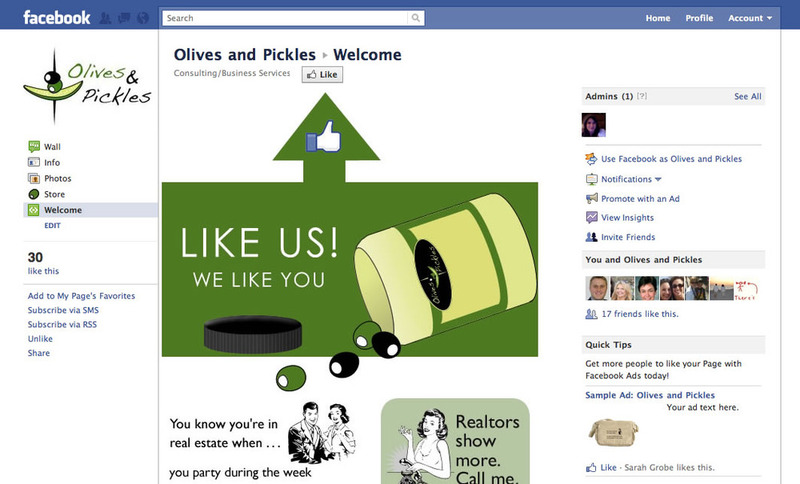 Posting your listing to Facebook is not only easy, it reminds your SOI that you are in the real estate industry. Just remember to make sure it’s not ALL you do on Facebook. A good rule of thumb is 80% social, 20% business. YouTube is the second most powerful search engine. Posting your listings on YouTube not only gives you SEO power it can set you apart from your competition. I’m doing a bit of field surveying right now on both of these to provide you with the best solutions. Look for an update from me soon. August’s Select Circle: August roundtable will cover our new marketing options. Join us to review the above action steps and more! Mark your calendars for Thursday, August 18th 10:00 a.m. – Noon at the Home Office Training Center, 1650 Des Peres Rd., Suite 205. Please register on the Resource Center if you plan to attend. Online Prospecting Ideas: I’ll be creating a new post soon about online prospecting ideas which we’ll also touch on at the Select Circle. Resource Center: we’ll be adding these action lists to the Resource Center for easy access! I’m sure you’ve noticed by now that I’m a strong believer in transparency about what we are doing and why. Today I’m covering the changes we are making to our marketing plan as of July 2011. Our Classified ad budget in the St. Louis Post Dispatch will be re-allocated to Zillow and Yahoo Real Estate for the next six months. This coming weekend will be our last week of corporately sponsored ads in the St. Louis Post Dispatch. Our Search Engine Marketing budget will be re-allocated to Search Engine Optimization for the next six months. Our support of Your Next Home magazine is increasing. The company will now support one month of advertising in Your Next Home for all new listings taken over $100,000. Your personal web address and phone number will be included. Leads from the four major portals will be driven straight to you on all your listings. You’ll receive them by text/email. You’ll see monthly reports on the campaign including the number of leads generated both online and via phone calls. Where is our advertising budget going? Last month we spent almost half of our advertising budget on classified advertising in the St. Louis Post Dispatch. 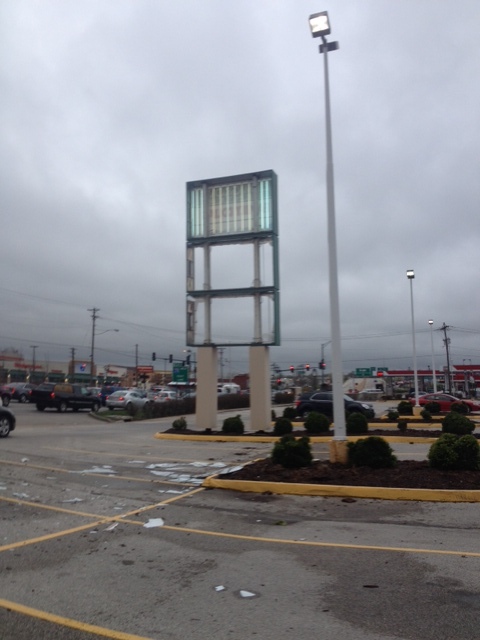 This is a huge chunk of our advertising dollars to invest in a 5 line, text only ad. Is this really the most effective use of our budget? 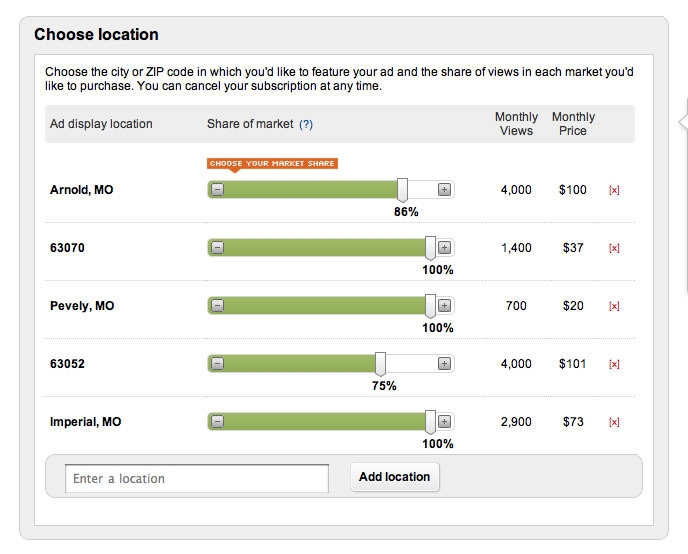 By reallocating our St. Louis Post Dispatch expenditures we can increase our online exposure on the top four real estate portals. Together these portals drove over 45,000,000 visitors last month. How is this change good for you? When a consumer goes to Google or another search engine and enters ‘st. louis real estate’ you can guarantee that Zillow, Trulia, Realtor.com and Yahoo Real Estate are going to be within the top search results. These national portals have an enormous amount of marketing dollars invested in SEO/SEM (search engine optimization and marketing). Now if the consumer gets to any of these portals, they can also get to you. Your listings will not only be there, they will be at the top of search results with leads directing to you. When a visitor views a search result list on one of these portals, the listings at the top of the list are considered ‘featured’ properties. If the search returns several hundred properties that match, an un-featured home may very well be the 175th on the list. Which means your listing never gets seen. 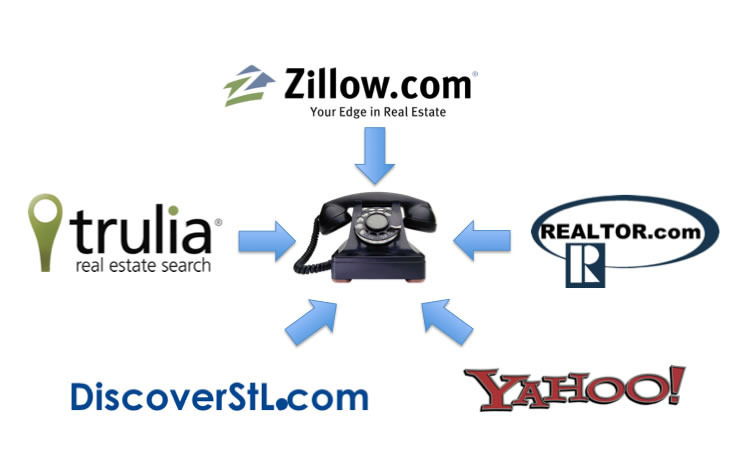 With these changes your listings will now be featured (moved to the top) on Yahoo, Zillow, Trulia and of course, DiscoverStL.com. 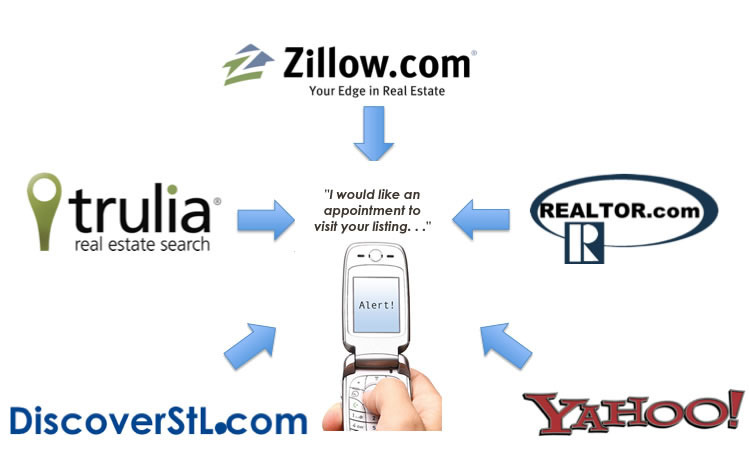 Any request from your listing on Yahoo, Realtor.com, Zillow, Trulia or DiscoverStL.com goes directly to you. You’ll get the request as a text to your mobile phone, sent to your email and recorded for future reference on your website’s client management side. As always, there is no referral fee on these ——-> it’s your listing. Each portal will have a unique phone number that forwards to our offices on a rotating basis, increasing the number of opportunities available on phone duty. The unique number also allows us to track the number of responses we’re receiving from each portal. Which brings me to my personal favorite thing about this change. I am routinely going to send you updates on the number of calls, leads and visits we get from each online initiative. You’ll be able to view the direct results of this campaign and we’ll be able to evaluate it’s effectiveness. If it doesn’t work the way we’re anticipating then we’ll go back to the drawing board. The important thing is to get these buyers into your hands. Make sure you know how to identify these buyer leads so you don’t miss an opportunity. Step-by-step guide below with examples. 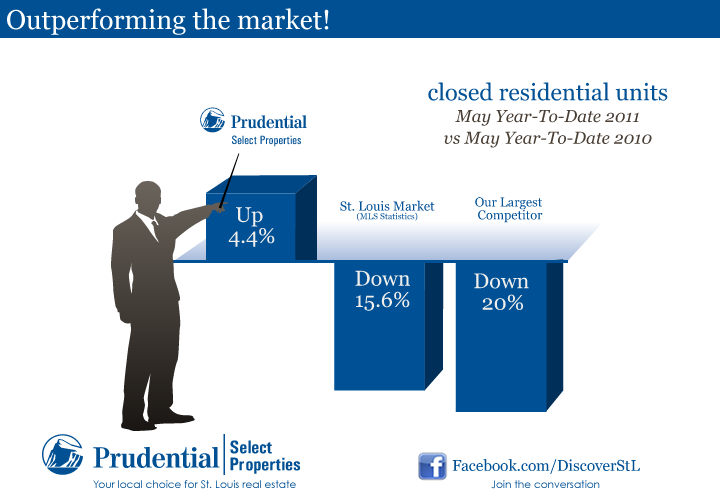 Prudential Select Properties will support new listings in Your Next Home for the first month of the listing. The full color ad will direct to your website and have your mobile phone number. There is also now an option to add the Sunshine Kids logo to your listings in the magazine. For the next six months we’ll be taking the part of the budget we were using for search engine marketing (buying ads on the first page results) and using it towards optimizing our site so we organically pull in the search results for keywords like ‘st. louis real estate.’ I’ll also be sending out reports on this each month. We expect to be able to drive more leads to you with this change. If you have questions remember you can email me at Sarah@DiscoverStL.com. In a Nutshell: Now send market related Facebook updates by just pushing ‘share’ from the Prudential Select Properties Facebook page. A number of you have approached me with the question, ‘I want to use Facebook to share updates on the current real estate market. What do you suggest?” I’ve also noticed how some of you struggle converting our materials into a format compatible with Facebook. To help you out, anytime I release new marketing pieces I’m also going to release a Facebook compatible piece. 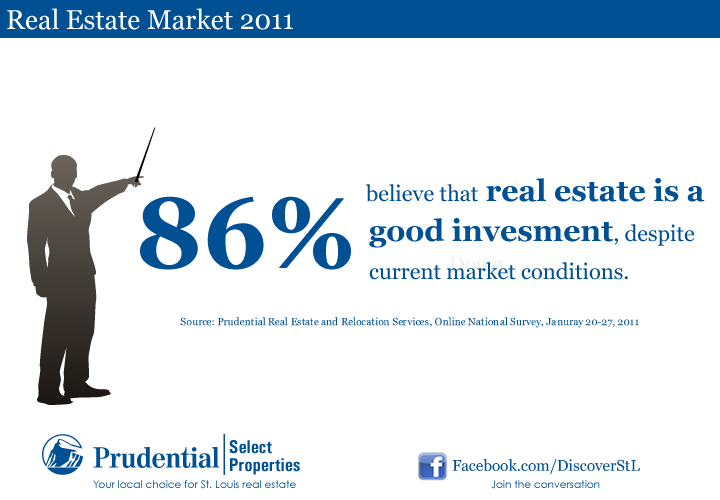 On the Prudential Select Properties Facebook page I added a corresponding image (see below). On Facebook, all you have to do is push the ‘Share’ link to display it on your page for all your Facebook friends. If YOU see something that should be shared PLEASE let me know!!!! Remember you can email me anytime at Sarah@DiscoverStL.com. Marketing Tip: When using Facebook for business remember 80% of your content should be SOCIAL and 20% should be BUSINESS. You do not want your Facebook newsfeed to look like spam or an endless infomercial. 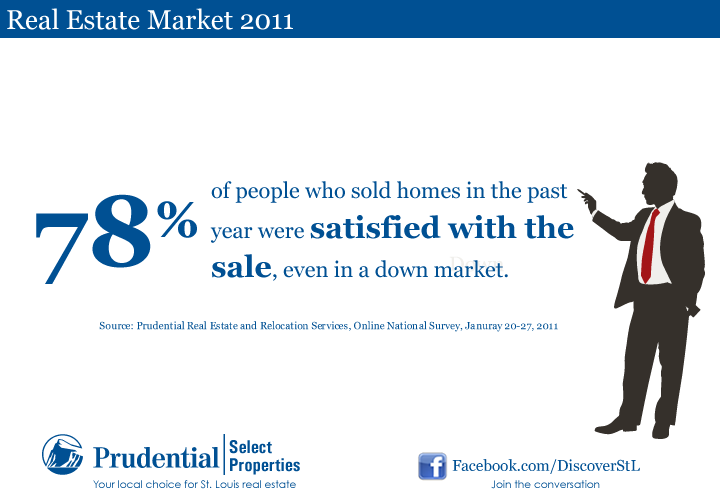 In a Nutshell: Visit the Prudential Select Properties Facebook page and ‘share’ these statistics. I’ve taken statistics provided by Prudential Real Estate from their Online National Survey completed in January 2011 and created an online shareable picture gallery. 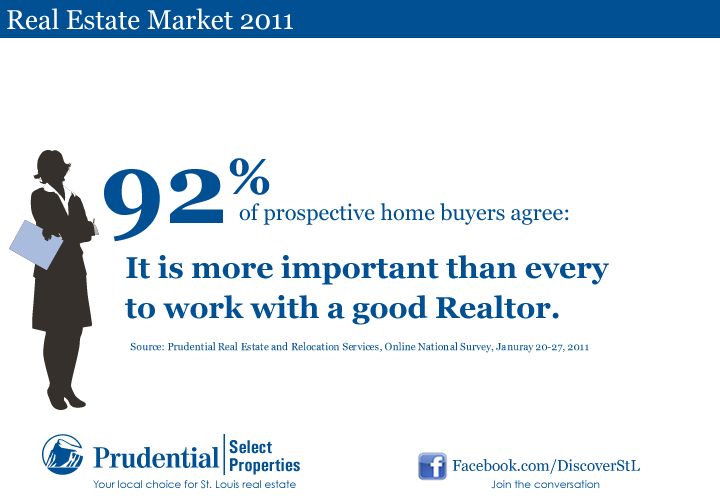 See it below or visit the “Prudential Select Properties‘ Facebook page to share them. In a Nutshell: Now your listings have unlimited photos on Trulia and Zillow. 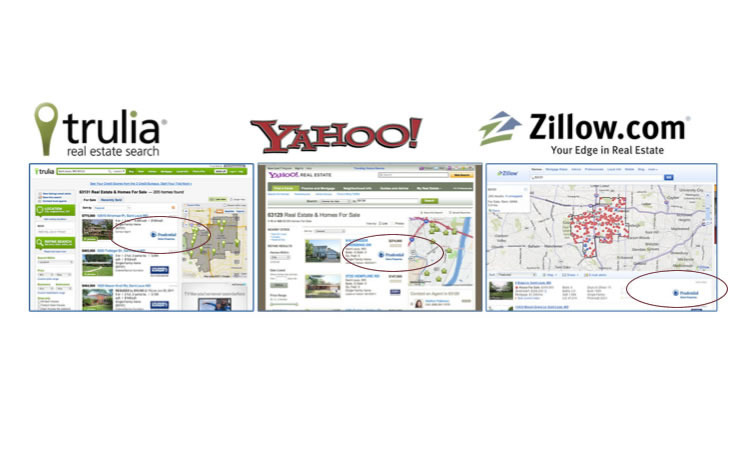 We’ve always provided syndication to Trulia.com and Zillow.com for your listings. However, in the past we’ve been capped at only showing five photos on these sites. Starting last week, both Trulia and Zillow now display our entire photo feed from the local MLS. Just one more way we’re making sure you’re providing the maximum amount of exposure on listings to your customers. 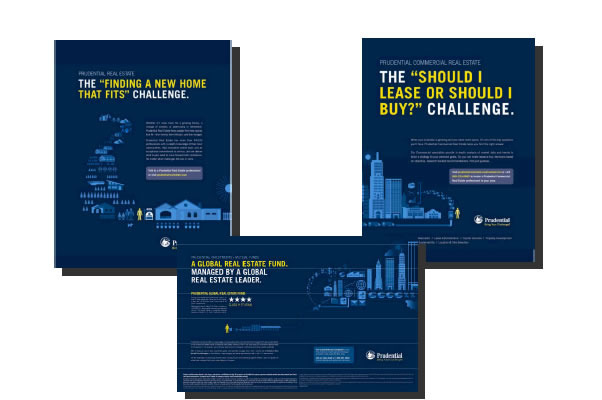 In a Nutshell: Prudential has released a new brand campaign supported by print advertising, commercials and digital ads. The campaign highlights the tough challenges facing the economy and Prudential’s goal to help solve these. As a part of the campaign Prudential has created a website (www.Prudential.com/BringYourChallenges) with short videos discussing these challenges.